Out vinyl siding carries a transferrable 50-yr to lifetime warranty! 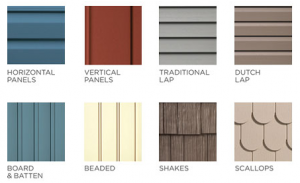 Whether you want to improve the appearance of your house or you are willing to re-create a distinctive look, siding can bring your vision to life without breaking the bank. We provide a wide variety of colors and profiles including clapboard, shakes, faux brick/stone, scalloping/gingerbread, etc. A maintenance free vinyl exterior siding can save you the required painstaking work of repainting or staining as the weather deteriorates your finish over time. Vinyl siding, unlike wood, is not susceptible to water damage or rot. 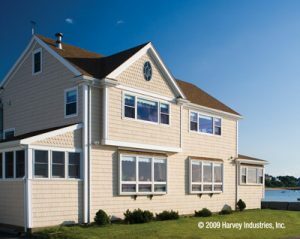 Modern vinyl technology has allowed for accurate reproductions of not only clapboard siding, but also cedar shakes and intricate wooden detail trim such as on overhangs, gables and bead board ceilings, available in a wide variety of colors and profiles to match the exact architectural details of your home. As a part if a quality siding installation, we will carefully custom-fabricate finish trim around windows and doors. We take great care in reproducing exact replicas of existing wood trim, while insuring weather-tight, maintenance-free coverage, keeping the original character of your home. Our skilled, professional installers will address your specific ideas in keeping or changing the look of any aspect of your home. Looking to replace the siding of your home in Southington, CT or Meriden, CT? Look no further! Call us for expert installation and quality products! Request a FREE ESTIMATE of your siding replacement job today!